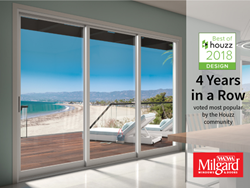 Milgard® Windows & Doors has recently received Best of Houzz in Design for the 4th year in a row. "The Houzz community selected a phenomenal group of Best of Houzz 2018 award winners, so this year's recipients should be very proud,” said Liza Hausman, vice president of Industry Marketing for Houzz. Each year Houzz Inc., the leading platform for home renovation and design, allows their community of over 40 million users to select their favorite Design photo found on the Houzz platform, and Milgard was once again in the top three percent of more than 1.5 million photos on the site. This people’s choice award, called “Best of Houzz Design”, denotes the most popular images on Houzz and is identified by a specific badge that appears on the page of the winning business. Those who win multiple years in the same category help homeowners and shoppers identify a company focused on excellence. Milgard regularly adds photographs of recently completed home renovations to Houzz and is considered a top resource for design ideas and inspiration on remodeling and new home construction projects. With our breadth of options ranging from vinyl and wood to fiberglass and aluminum, Milgard window and patio door products can fit into any home style. Milgard Windows & Doors, a Masco company based in Tacoma, Washington, offers a full line of vinyl, wood, fiberglass and aluminum windows and patio doors for builders, dealers and homeowners, backed by a Full Lifetime Warranty, including parts and labor. The company has been recognized as Builders Choice for vinyl and fiberglass windows in the Western United States, in a yearly survey sponsored by Hanley-Wood Inc., publishers of BUILDER Magazine. Milgard® is the highest online rated window and patio door brand, as measured by the 2016 NRS consumer sentiment study conducted by MetrixLab and commissioned by Masco. Milgard has approximately 3,800 dealer locations nationwide. For more information, visit milgard.com or call 1.800.MILGARD.